Apartment complex property managers have to spin many plates to be successful at what they do. Keeping current tenants happy, attracting new ones, dealing with unsightly property damage, keeping the place looking great within a certain budget… the list goes on and on. In fact, one area that touches on all of these aspects is the parking lot. It’s both a safety and curb appeal issue that can impact the way investors and tenants feel about the complex, so it can significantly impact the budget. Safety and well-being—If you have an experienced commercial asphalt contractor install a great asphalt parking lot, it causes relatively little inconvenience to your tenants during installation while giving them a smooth, great looking parking lot that drains well and keeps their cars safe for years to come. A fresh-looking, smooth, well-maintained asphalt parking lot is a surprisingly big curb appeal issue for potential tenants. The condition of the parking lot, which is one of the first things they see when they drive in for a walk-through, is the first indication they have as to the general condition of the apartment complex and your property management team’s active involvement in keeping the place looking and functioning well. Good property managers always allot part of the annual budget for asphalt repairs and maintenance, even if you don’t need to have major repairs done annually. 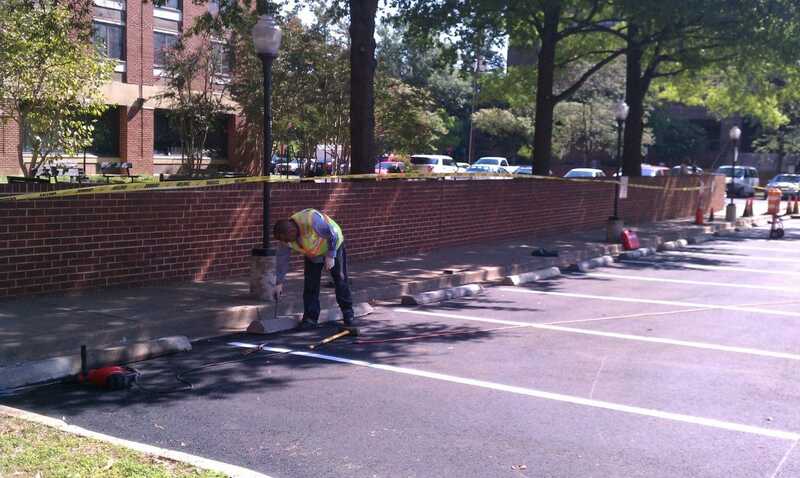 Every couple of years, depending on traffic, sealcoating, crack filling, and parking-spot remarking (all of which are relatively inexpensive when you consider that these activities will prevent major repairs down the road) will keep the your asphalt parking lot looking and functioning well and safely for 20 years or more. Any of the asphalt maintenance and repair budget not used can be saved for that two-decade mark when a new asphalt installation becomes necessary. At the same time, while you keep the parking lot safe and looking new, tenants view this as a positive and continue to rent and renew their leases. ……by at least 5 percent! If you are looking to sell the property to another company, the fresh, clean, smooth, well-maintained parking lot is a point in your favor. Again, your asphalt parking lot is going to be one of the first things that potential investors and buyers see, and will give them clues about the rest of the property. So don’t overlook the parking lot when it comes time to make regular property improvements. Of course, the parking lot is only going to be as good as the contractor installing it, so doing your homework on asphalt contractors is important. Espina Paving has been installing, maintaining and repairing apartment complex parking lots for three decades and has a long track record of reliability and quality craftsmanship on each of the asphalt parking lots we install. Contact us today for a free estimate at (703) 491-9100 and we can help you make sure your asphalt parking lot becomes a great asset to your apartment complex!